A menu is the most important internal marketing and sales tool a restaurant has to market its food and beverage to customers. Think of a menu as a restaurant’s business card. It introduces the customer to the restaurant, and its design complements the décor, food quality, and the price range of the restaurant. 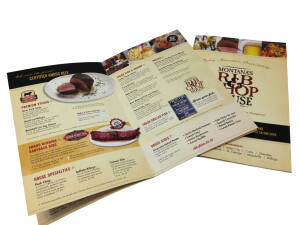 Increase your customers’ restaurant sales with custom menu printing! See how a great menu printing devours the competition! Ask about our waterproof and tear resistant stock for your next custom printed menu project. Impart a lasting impression by using synthetic paper on you next menu project!